The artistry, history and elegance of vintage cufflinks. Antique cufflinks are miniature windows into the past. They capture the elegance, spirit and artistry of a bygone era and bring the past into the present. This blog is devoted to the passion for these miniature masterpieces. Summer is here! White clouds are floating across the blue sky, the garden is abloom with flowers, and brightly colored towels and umbrellas decorate the beach. What better way to celebrate the beginning of summer than with a parade of colorful cufflinks. And, since Independence Day is just around the corner, we will start the parade with some red, white and blue fireworks. 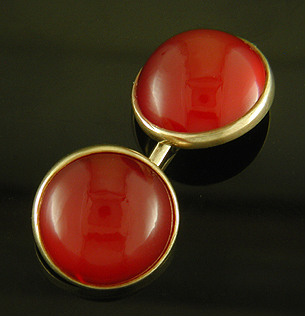 Arresting, sultry red carnelians set in bright yellow gold. The striking contrast of the red carnelian and yellow gold settings reflects the bold colors and contrasts favored during the Art Deco era. Created by Wm. Huger & Co. in 14kt gold, circa 1925. 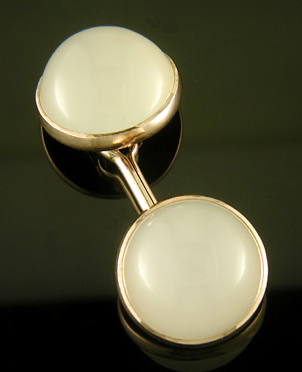 Sansbury & Nellis white chalcedony cufflinks. Translucent, foggy white chalcedony (a fine grained variety of quartz) set in rose gold. The luminous chalcedonies brings to mind early morning fog burning off with the first rays of the sun. A nice example of the striking white jewels of the late Art Deco period. Crafted in 14kt rose gold, circa 1930. 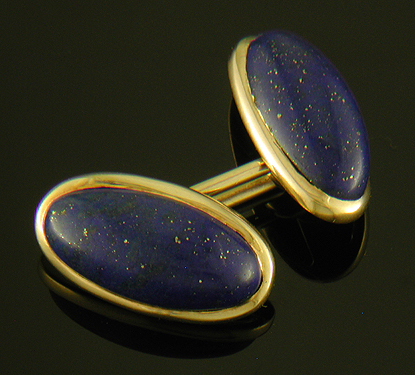 George Street lapis lazuli cufflinks. Regal blue lapis lazuli wedded with the warmth of antique gold. The interplay of the rich blue of the gemstones and warm yellow of the gold speaks of the elegance of the past. Created by George O. Street & Sons in 14kt gold, circa 1900. 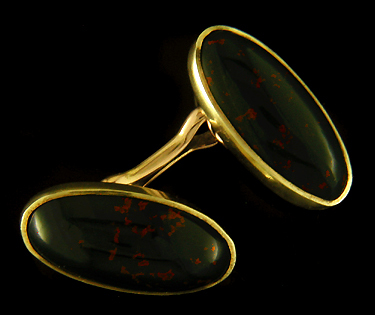 Sansbury & Nellis bloodstone cufflinks. Heliotrope, more commonly known as "bloodstone," is a beautiful gemstone with bright red spots set in dark green jasper. The finest examples have the mesmerizing appearance of fiery embers smoldering in a dark bed of ashes. These Art Deco cufflinks feature elongated oval heliotropes set in bright yellow gold. Crafted in 14kt gold, circa 1920. 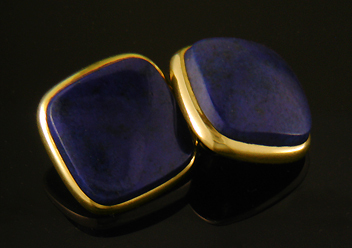 Lapis lazuli and gold cufflinks. During the Art Deco era the passion for bold, dramatic colors found ready expression in lapis lazuli. The rich blue of the lapis set in these cufflinks is accented with small bits of pyrite (fools gold) that shimmer and sparkle like golden confetti falling in the midnight sky. These elegant cufflinks capture the festive, raucous spirit of the Jazz Age. Crafted in 14kt gold, circa 1925. 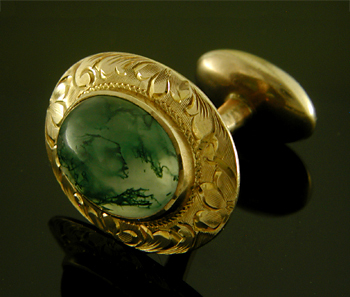 Victorian moss agate sleeve buttons. Victorian sleeve buttons with mesmerizing moss agates. The moss agates feature a swirling tangle of green inclusions that glow like seaweed floating in filtered sunlight above the ocean floor. The gemstones are set in gold frames with richly engraved leaves and scrolls. Crafted in 10kt gold, circa 1900. Larter & Sons hawk's eye tuxedo set. An elegant tuxedo set with hawk's eyes in yellow gold. Hawk's Eye is a striking variety of quartz with deep blue edges shading into a glowing, bluish-gray "cat's eye" across the middle. The shimmering cat's eye effect (or "chatoyancy") and color of the gemstones plays beautifully against the warm tones of the yellow gold. This dress set was created by Larter & Sons in 14kt gold, circa 1950. 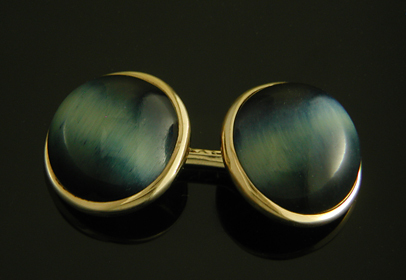 Recent additions to the Antique Cufflink Gallery include an elegant pair of platinum and pearl cufflinks by Carrington and Tiger Eye spool cufflinks from Sansbury & Nellis. In the Antique Stickpin Gallery recent additions include a striking turquoise stickpin created by Hayden Wheeler and an inquisitive, diamond-seeking serpent from Carter, Howe. Wheeler Turquoise A striking turquoise floats like a small planet amid swirling curves. This stickpin beautifully weds the flowing curves of Art Nouveau with the symmetry and Medieval themes favored by the Arts & Crafts movement. Crafted in 14kt gold, circa 1900.